My alarm goes off everyday at 4:30 AM; I pop out of bed, make my shake and I’m out the door to exercise. Before you roll your eyes in disgust and think oh great, another morning person, let me tell you it wasn’t always the case! Seven years ago when I met my husband I couldn’t tell you the last time I had been to the gym. Not that I didn’t have a gym membership…I just didn’t go. It wasn’t as though I was doing absolutely no exercise. I did go to karate 2-3 days a week. But if you have ever been in love and in a new relationship you know how those first few months or more nothing else really matters except for that other person. Family? What family? Friends? Who? What? And definitely, workout? Who cares!!!!!! Of course, all of these meals were accompanied by appetizers and a bottle (or two) of wine. Now don’t get me wrong, I AM a food whore, I LOVE food and I’m not complaining but after 6 months or so of indulging in delicious food and wine with little to no exercise I had gained over 15 lbs. I tried to change my calorie intake at first by asking Brad if I could cook dinner for him at his house instead of going out all the time. If you know Brad at all then you know two things about him A) he hadn’t used his own stove / oven for a long, long time and B) he is an obsessive compulsive cleaner. No joke, the man had to get a new oven. Not from too much use, but from never using it. The buttons had corroded to the point they wouldn’t turn!!! At any rate, home cooked meals or not, I still wasn’t losing any weight so I decided I would start going to the gym. Brad was going to the gym in the afternoons so I decided I would try to do the same. However, I found throughout my eight hour workday I could pretty much talk myself out of going to the gym for one reason or another. Someone suggested that I try working out in the mornings. The thought of leaving my warm bed for the stupid gym…uuuhhh not appealing at all! Yet after a few more months of failed afternoon workout attempts I set my alarm for 6:00 AM. They say it takes 30 days to break or make a habit. I would say it took me a full year. The first 6 months I missed half the workouts and snoozed instead. In the following 6 months I started to become more and more consistent. I am not going to say it was easy because that would be a straight up lie! But the benefits started outweighing the excuses and I kept setting my alarm for 6:00 AM. I started losing the weight I had put on because I was consistently working out. I was at the gym 5-6 days per week. I started having more energy in the mornings and through out the entire day. I dropped clothing sizes, had more confidence and felt better all around. Today I couldn’t imagine not working out in the mornings! 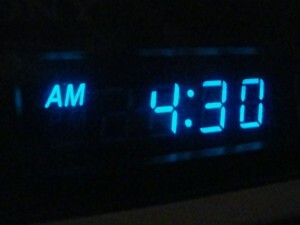 Even if I am training clients I will get up earlier and workout before. Do I sometimes have to go to bed at 8:30? Yes. Is it worth it? Yes! Should you try it? YES!! I tell my clients who are struggling to maintain a regular workout routine to try switching to the mornings. Give 30-60 minutes of your day to exercise and the rest is free time! Get it done before your brain wakes up and starts thinking of excuses! Pack your gym stuff the night before. Have your workout clothes (and shoes!) out and ready. Move your alarm away from your bed so you have to get up to turn it off! Find your motivation. Whatever your reason for wanting to workout out find a picture that represents that and put it where you will see it in the morning. Don’t give up! So you missed 5 days out of 7 just keep setting that alarm!